Is your washing machine making your clothes dirty? There are many reasons why a washer can leave stains or marks on your clothing. An older washer with chipped paint, excessive fabric softener, or a dirty door seal could be the cause. These reasons may dirty or stain your clothing when washed. You washer is supposed to clean your clothing not stain them. You need to find out what is causing the problem by inspecting the washer. We will go over some issues that can cause the washer to have this residue fault. Try This Quick Fix = The washer drum may have grease, fabric softener, detergent, or oil that is present from earlier washed clothing. 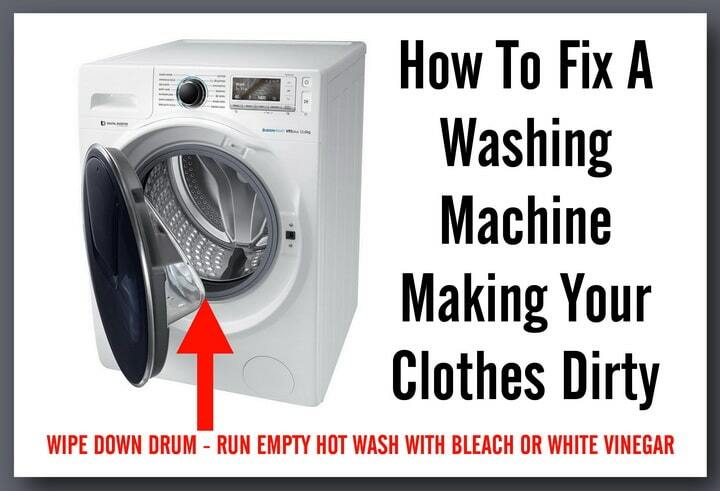 It is best to run a hot water empty wash cycle with a cup of bleach after wiping down the inside of the washer drum. This will remove any softener or grease that may be staining your clothing. The washer drum may have accumulated grease or oil from recently washed clothing. 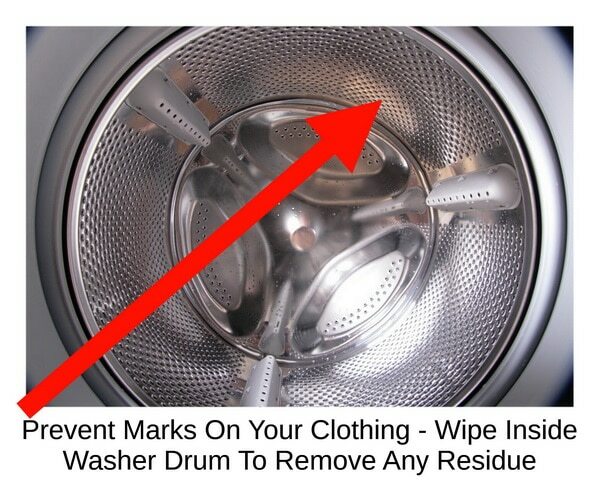 This can cause the next load of clothing to get grey stains or black marks when washed. To fix this problem you can wipe the inner washer drum with a damp washcloth to remove any greasy residue. Once you have cleaned the drum, run an empty hot water wash cycle with one cup of white vinegar to further clean out the drum. Any chipped enamel paint can cause rust stains on your clothing. This causes a brown or red colored stain on your clothing. The only way to truly fix this is to repaint the affected area. To fix the rust issue, carefully sand down the affected area. Use a rust resistant appliance paint and apply the paint to the chipped area. Once the rusted area is painted over, this will prevent any further rust stains on your clothing. Using too much fabric softener can cause it to lump up and cling in certain areas. The softener can then stain your clothing when washed. To fix this problem, reduce the amount of fabric softener used and reduce the amount of clothing put in for each wash. Clean out the inner wash drum with a warm damp washcloth to remove any clumped up fabric softener. The rubber door seal on front loading washing machines might have clumped up detergent/softener that can rub off on clothing. Always wipe the rubber door seal off after washing your clothing. Mold or mildew can also be present so cleaning is a must. Leave the washing machine door open when not in use to allow air flow and avoid bad smells and mold growth. If a part in the washer begins to deteriorate, this can lead to stains on your clothes. The door seal, pump or other parts can crack, rip, or break and get grease or stains on your clothing. To fix this, you will need to troubleshoot the washer and find out which part is causing the washer to stain your clothing. Unplug the washer and turn off the water when troubleshooting the issue. How to prevent stains on clothing from dirty washer – Every 30 days run an empty cycle with hot water = Use 1 cup of white vinegar and a scoop of soda crystals (bicarbonate of soda). 1. Do not use excessive fabric softener as it can clump/clog. 2. Wipe down the washers inner wash drum to keep clean and free of grease/oil/detergent. 5. Try to always wash white clothing in hot water as cold water promotes mold. How To Prevent Odor In Front Load Washer? What Causes A Washer To Smell Bad? If you need help with solving a problem with your washer leaving marks or stains on your clothing, let us know your problem in detail below and we can assist. Previous post: Water Heater Leaking Water – How To Fix The Water Leak?